Hey, heard a good story lately? We have and we’d love to share it with you and your guests! Storytelling is a wonderful past-time loved by young and old. 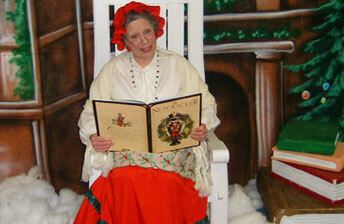 All Storyteller Shows are custom designed and can last 15, 30 or 45 minutes. We offer two distinctively different styles of custom storytelling. The Traditional Storyteller Show invites the audience to enjoy passively, as they relax and allow their minds to create the visuals while the tale unfolds. Our Interactive Storyteller Show requires group involvement. These shows are re-enactments of famous (and maybe not so famous) stories, using the guests as the characters. With minimal costume and prop pieces, your guests become the visual to the story while they create laughable moments and great opportunities for camaraderie. These shows are perfect for Holiday events! (Think of Bob in accounting standing up there wearing a set of reindeer antlers and a foam red nose).